Solomon Islands Football Federation (SIFF) Small Sided Games Development Officer, Victor Waiia, says that the Kurukuru Challenge will be an exciting event for futsal fans in Honiara with 6 action packed games happening during the coming week. Besides Kurukuru the other teams in the competition are Honiara Lions, Honiara Giants and Honiara Community Bulls with the players coming from the 2010 Honiara Community Futsal League which featured 48 teams. Honiara Lions and Honiara Giants are dominated by former Kurukuru stars and players who were not selected into the final Kurukuru squad announced in March but were members of the training squad. 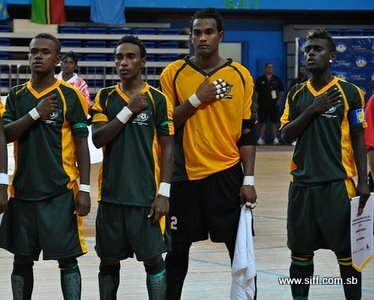 The objectives of the Kurukuru Challenge is mainly to give the national side a meaningful test before they depart for the Oceania Football Confederation (OFC) Futsal Championship which is coming up next month but it is also aimed at giving local players a competitive avenue in the first half of the year because the futsal league will not start until after August. Waiia says that the Kurukuru Challenge will give national futsal team a good measure of their strength because the players in the other participating teams are among the top rated in the local league in 2010. “This is a great opportunity for the Kurukuru management to assess their players and also look at their tactic and fitness level. They have been working hard since November but this will be their first competition and I think it will shape the team for the world cup qualifiers,” Waiia says. Kurukuru assistant coach Jerry Sam is welcoming of the championship and says that the national team is looking forward to taking part. “We believe that it will be a good test for our boys. Training has intensified over the last 2 months and the boys are very fit so we are keen to see them in action,” Sam Says. The Kurukuru Challenge will take up the most of coming week and the Honiara City Council (HCC) multipurpose hall will once again be the centre of attraction for futsal fans once the competition kicks off. The winner of the championship will walk home with $3000-00 while the second and third placed teams will claim $1500 and $1000 respectively and the team bottom placed team will win $500-00. Entry to HCC Multipurpose Hall for the Kurukuru Challenge is set at $5-00 for adults and youth and $2-00 for children.